Matt Stonie is a highly ranked professional eater, famous for dethroning the infamous Joey Chestnut at the Nathan’s Hot Dog Eating Contest in 2015, only to lose the title this year. In between these competitions, Stonie keeps in shape by consuming massive quantities of food, a process he then posts to YouTube: mountainous ice cream sundaes, Hot Pockets, pancakes, and so on. It’s disgusting. His consumption of this vat of Starbucks’ beloved pumpkin spice latte, though, may take the repulsively oversized cake. 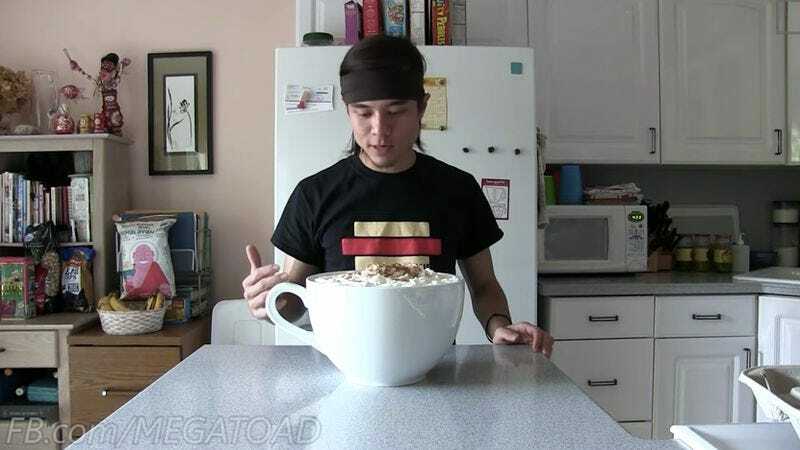 He starts by pouring seven large cups of the viscous, autumnal fluid into an oversize porcelain mug, which he then tops with a proportionally large mountain of whipped cream. “This thing looks really good, it smells really good, and it’s gonna cost me about 4,000 calories,” he says, before consuming it in about two minutes in a single unbroken shot. Over the course of that shot, Stonie can be seen wincing, emerging for air, and using a spoon to stab at and then consume whatever semi-solid goo formed in the dregs of that seasonally seasoned swamp. He says toward the beginning of the video that this is his first-ever pumpkin spice latte; we can only hope that it is his last.